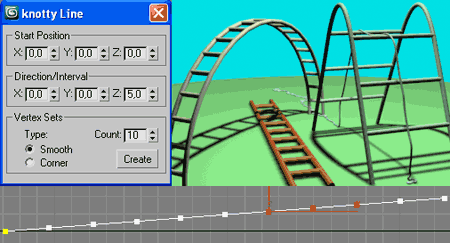 "knotty Line" is a auxiliary mini tool for spline modeling. It's draws a line with the set number of vertex. but nowhere can find something similar, so I make my own. Of course, anyone can use my script for many other tasks. not directly, of course, but as an auxiliary method in spline modeling process. I wrote a short example "How to make a ladder" in my blog. Submitted by Anubis on Wed, 2009-12-23 12:32. @k2000 - interesting idea, well, this way will works as dividing spline, but if you like this feature then I'll think about it after the holidays. At http://www.maxplugins.de/ you can find a spline modifier named HSpline, so you can try it as well. Submitted by k2000 on Wed, 2009-12-23 01:40. There are some options to add - please try out making a spline with mouse click (just start and end points). Submitted by one808 on Fri, 2009-12-18 02:41. Submitted by frnkcrnk on Fri, 2009-08-28 02:22.
there are a few things I'm planning to do with this script.